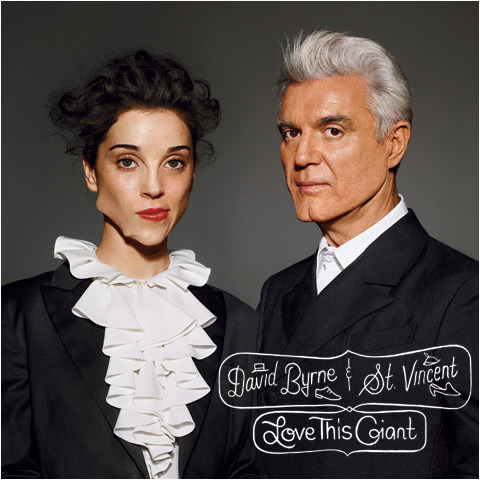 David Byrne & St. Vincent have confirmed the September 11 release of their album, ‘Love This Giant,’ to be released worldwide by 4AD under exclusive license from Byrne’s label Todo Mundo. * Recorded over two years largely at Water Music in Hoboken, NJ, the album is a collaboration in the truest sense of the word, with Byrne and St. Vincent (aka Annie Clark) co-writing ten of the album’s twelve tracks, and each artist penning one song individually. The album centers around an explosive brass band and is propelled by John Congleton’s drum programming. See below for complete tracklisting. Byrne and Clark will launch a 24-date fall tour on September 15 in Minneapolis. “We’ll be doing these songs and a bunch of songs that we suspect people will know, with a group that includes eight brass players, a keyboardist and a drummer,” s ays Byrne of the tour. See below for complete dates. “There was no delineating what the roles were,” explains Clark of the recording. “It’s a collaboration I’m truly proud of.” The duo also split lyrical and vocal duties on the record, which despite eschewing a traditional guitar/bass/drums lineup in favor of idiosyncratic horn arrangements, presents itself as infectious and modern hook-laden rock. Byrne and Clark met in 2009 at the ‘Dark Was the Night’ benefit at Radio City Music Hall and were approached shortly after by the Housing Works Bookstore to collaborate on a night of music. They began composing remotely, trading song ideas and structures online while Clark toured and it quickly became apparent that they had more than just one night of music in them. Byrne performed with Clark at her ‘American Songbook’ show at Lincoln C enter in 2010, and Clark contributed vocals to Byrne’s ‘Here Lies Love’ album, released the same year. Stay tuned for more info on the album and tour.